Omaha, NE, September 19, 2018 --(PR.com)-- Safety Reports, a leader in the development of mobile safety solutions, has released a new app that allows users to conduct essential safety talks and track employee attendance from a smartphone or tablet. 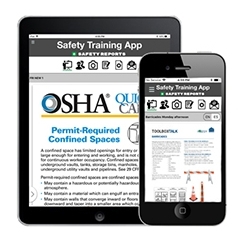 Available for Apple® and Android™ operating systems, the Safety Training App is preloaded with dozens of Toolbox Talks from the Occupational Safety and Health Administration (OSHA) and the Center for Construction Research and Training (CPWR). Users also have the ability to import additional training documents into the platform. Through the app, users can schedule trainings and track/confirm employee attendance. Optional, built-in signature-capture and training session photos can be included in the training reports for enhanced proof of attendance. Polich added that future plans include expanding the app’s current capabilities to include video Safety Talks. For more information about the Safety Training App and Safety-Reports, visit www.safety-reports.com. Apple is a trademark of Apple, Inc., registered in the U.S. and other countries. Android is a trademark of Google, LLC.